When the lower esophageal sphincter (LES) fails to contract, it allows digestive acids to travel backward from the stomach to the throat, causing burning sensations in the chest. This is what’s known as heartburn, or, in more severe cases, acid reflux or acid indigestion. Other symptoms include bloating, burping, nausea, mouth soreness, dizziness, and hiccups. Heartburn is often triggered by stress and the consumption of greasy, fatty, or spicy foods. There are plenty of commercial antacids available over the counter, but their effects are short -lived, and they often contain chemicals that cause unwanted side effects. Instead of wasting money on those, try almond milk. It’s a natural, affordable, effective home remedy for acid reflux and heartburn. Before we tell you exactly how to use it, take a look at the reasons why it works. 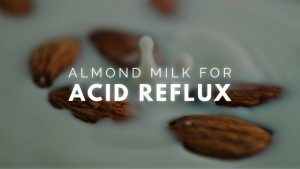 Is Almond Milk Good for Acid Reflux? Almond milk is alkaline, it neutralizes stomach acids that cause heartburn. Almond milk contains vitamins D and E, manganese, magnesium, and anti-oxidants that support proper digestion. Almond milk is rich in calcium, which helps the LES contract properly, preventing acid reflux. Because it is plant-based, almond milk is low in unhealthy fats. It contains omega – 3 fatty acids that reduce inflammation caused by digestive acids. Almond milk coats the linings of the esophagus and stomach, preventing corrosion of delicate tissues while soothing burning sensations caused by heartburn. The natural oils in almond milk also neutralize digestive acids. Almond milk can be used alone and in combination with other natural ingredients that keep the digestive system healthy. Drink almond milk daily, use it with cereal and oatmeal, put it in coffee and tea, and try all the recipes below. In a blender, mix 1 cup of unsweetened almond milk, 1 cup of fresh strawberries, 1 fresh banana, and 1 cup of spinach until smooth. Drink at least 3 times a week. In a blender, mix 1 cup of unsweetened almond milk, ½ of a fresh peeled avocado, 1 fresh banana, 1 tablespoon each of raw honey, bee pollen, chia seeds, and ½ teaspoon each of ground cinnamon and vanilla until smooth. Fill 2/3 of a mug with green tea. Fill the last 3rd of the mug with cool almond milk. Drink whenever you get heartburn. You may also try Green Tea as a home remedy for acid reflux. Cook your oatmeal using almond milk instead of regular milk. Mix in banana slices and top with raw honey and flax seeds to further neutralize stomach acids. Eat at least 3 times a week. Cook ½ cup of oatmeal in 1 cup of unsweetened vanilla almond milk. Mix in 1 tablespoon of toasted coconut, 2 tablespoons of brown sugar and banana slices. Eat this to get rid of acid reflux. In a blender, mix 1 cup unsweetened almond milk, 1 cup of apple juice, 1 cup of frozen pineapple chunks, ½ cup of strawberries, ½ cup of plain Greek yogurt, and 1 teaspoon turmeric until smooth. Drink this before breakfast to get rid of acid reflux. In a blender, mix 1 cup of unsweetened almond milk, ½ cup each of cantaloupe, watermelon, and honeydew, and 2 teaspoons of ground ginger and 1 ripe banana until smooth. Have this whenever you have acid reflux. Ginger is a best home remedy for acid reflux as it helps to reduce the back up of contents into esophagus. In a soup pot, bring 250 ml of coconut milk and almond milk to a simmer. Stir in 10 leaves of rooibos tea leaves, 1 tablespoon of fresh ginger root, and1 teaspoon each of ground cinnamon, cardamom, and nutmeg. Let simmer 5 minutes to make a tea. Remove from heat and strain out tea leaves. In a blender mix, milk/herb tea, ½ of an avocado, 1 tablespoon each of chia seeds and coconut oil and a small handful of almonds and walnuts until smooth. sprinkle cinnamon or nutmeg powder over it. In a blender, mix ½ cup of unsweetened almond milk, 1 cup papaya chunks, 1 cup plain Greek yogurt, 1 banana, 2 tablespoons of raw honey, and 2 tablespoons of almonds until smooth. In a blender, mix 2 cups of unsweetened almond milk, 1 fresh banana, 1 tablespoon of almond butter, 1 teaspoon of raw honey and ½ cup crushed ice until smooth. Have this as a breakfast smoothie to get relief from the acid reflux. In a blender, mix 1 cup of unsweetened almond milk, 1 cup of torn romaine lettuce leaves, 2 fresh bananas, 1 tablespoon of raw cocoa powder, and ½ teaspoon of vanilla extract and blend until smooth. Add 1 cup of almond milk until smoothie reaches desired consistency. Drink this to get complete relief from acid reflux. In a blender, mix 1 cup of unsweetened almond milk with ½ cup each of strawberries, blueberries, and raspberries until smooth. Drink 3 times a week. Fill a container halfway with 1 cup of almonds. Cover them with water, put a lid on the container, and let soak overnight. In the morning, drain water. In a blender, mix soaked almonds, 3 cups of fresh water, and ½ teaspoon of vanilla extract until smooth. Strain mixture through cheesecloth to extract milk. Have this chilled milk before meals to reduce acid reflux. you can also add 1 teaspoon of flaxseeds instead of vanilla bean . Or use in the above recipes in place of store-bought almond milk. For best results, follow the advice below when using almond milk to treat heartburn and acid reflux. Always use homemade or store-bought organic, unsweetened almond milk in the above recipes. Make sure milk is fresh. Use almond milk only in recommended amounts as over-consumption of almonds worsens heartburn. If heartburn persists after 2 weeks of almond milk treatments, consult your doctor. These almond milk remedies must be used regularly for at least two weeks to effectively prevent heartburn and acid reflux. Almond milk remedies work best when used in combination with a healthy diet and regular exercise. Have you tried any of these methods for using almond milk to treat heartburn and acid reflux? Tell us which ones worked best for you! I suffer from extremely bad acid re-flux and almond milk has helped me a lot. I would wake up choking on the acid that comes up through my esophagus and take a big drink of almond milk and it got me through the night. I have started using apple cider vinegar now to help stop it altogether and it works like a charm but it tastes terrible. I recommend almond milk unless you have an extreme case. Heat a cup of water and add a bit of honey and your apple cider vinegar. Tadtes mich better that way! Try any method mentioned above in the article. Apart from that reduce stress levels, drink plenty of water, exercise regularly and eat smaller meals. Observe which food is causing acid reflux and avoid using it. I have used ‘Proven Old Amish Formula’, which is essentially raw apple cider vinegar. 2 tbsps in half a glass of water. It doesn’t taste as bad as people say. Symptoms reduce significantly in 2-20 mns. I’m experimenting with almond milk as well, jury still out on that. Supposed to have an alkaline ph which neutralizes acid. I have had reflux quite bad for two years, and it reached a point that everything triggered it, in spite of prescription medication. The erosion in my throat was bad enough that it would bleed sometimes. I was desperate. One night I was browsing and saw a recommendation to eat a handful of almonds. Well, I didn’t have almonds on hand, but I did have almond milk for a recipe I wanted to try, so I drank it. That was the first night in two years I was not awakened by reflux. Now I start and end each day with a small glass of almond milk. It has been three months now, and I’ve had no problems with the reflux since then. I have it in coffee, tea, smoothies, whenever. It has been such a relief! Hii m also suffering with acidity when I wake up in morning I feel something heavy or uneasy or acidic today 10 may 2017 I had taken almond milk(overnight soaked and grided added water and immediately take it) in morning empty stomach after my thirod tablet but I feel heart burnand burping more increases plz guide me how to take it. As you have taken almond milk after thyroid tablet, it might have interacted causing heart burn and burning sensation. If you are allergic to nuts, the almond milk consumption can cause heartburn as well. As you are taking thyroid tablet on empty stomach, we recommend consuming almond milk after 3 – 4 hours of it. I suffer from over-production of acid in my stomach, is there a a natural food that I can take to help alleviate this problem. I will immediately try almond milk and apple cider vinegar. Yes, you can try almond milk or apple cider vinegar and check if they solve the problem. I have GERD which is a severe form of acid reflux plus I am 8 months pregnant. Unfortunately when pregnant the only options you have to treat GERD is tums and zantac. Which don’t do much. I tried drinking a glass of almond milk every night before bed and since I started I have not had any flare ups at night and less flare ups during the day. For me this has been better than when I was taking prescription meds before my pregnancy! I recently purchased vanilla almond milk with sugar content of 13g. Is this less potent than unsweetened for blender mixed treats? Thank you. Is heated almond milk better for treating acid reflux than cold almond milk? What is a good almond milk regimen on a daily basis? Thanks! So I have acid reflux and it always feels likes something in my throat,. Well now that I’m not eating the foods i was,.what can I drink or take to keep the acid down? And down acid reflux make your throat feel like that….any help? I’m in a real quandary. Several years ago I was diagnosed with severe gastritis and ulcers, so I was put on Nexium. About five years down the road, I realized I needed to get off the Nexium, which I did and was fine for quite some time. When I started having problems about two years ago, I began taking the apple cider vinegar and water and haven’t had a problem until I caught the flu. I was in bed for ten days with fever, body aches, and a cough, and couldn’t eat much. Didn’t have the issue during the time I had the flu, it was immediately after. It’s been three weeks now and I’ve been living on acv/water, almond milk, bananas, avocados, etc. I’m in discomfort all day long. Any suggestions? Can you use sweet almond Milk for acid reflux, or do it Have to be unsweetened almond milk. I’m excited to try some of these recipes. Recently diagnosed with LPR,. which is acid reflux thrat effects your larynx, hence major laryngitis as well as horrible coughing spells. I would like to ask the pH level of unsweetened almond milk. Having acid reflux for years, I just happened to get almonds on a flight I was on. Was skeptic about eating them but glad I did as my acid reflux went away. I naw drink almond milk every day and it really helps. Drink a glass of warm at bedtime and helps with my insomnia.